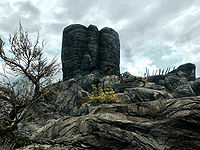 Bleakwind Bluff is a ruined Nordic tower inhabited by hagravens and Forsworn, located northwest of Rorikstead on an outcrop of rock. It is off a path that links Old Hroldan Inn with Rorikstead. The path leading from the main route is marked by a pile of rocks on the north side of the route. This path winds around a large rock before doubling back on itself and climbing the first of several flights of stairs that lead up to the tower, while still circling the outcrop. As you circle the first forsworn will normally be found at the top of a long flight of stairs with sharpened stakes along the left of the stairs. Beyond this there are two more short flights up to a campfire in front of the tower, where you will encounter a forsworn magic-user who prefers frost magic, a briarheart and a hagraven. A couple of paces south of the campfire is a doorway into the tower with a couple of bone chimes hanging down making a quiet entrance difficult. Inside there are the normal forsworn and hagraven symbols and decorations with an unlocked chest against the east wall, a copy of the Two-handed skill book King on the ground by a pile of rocks against the north wall. Behind the rocks is a stretched pelt between two sticks, with a garlic braid hanging from the left and a bunch of dried frost mirriam hanging from the right. Opposite this under a strange totem made of different bones and antlers, under another stretched pelt from some kind of animal is a bowl on a stand filled with three human skulls, along with a canis root, a bulb of garlic and a rock warbler egg among them. To the left of the bowl, against the wall is also a dead skeever. It is possible to rock climb around the outside of the tower, to the rear, where there is a lavender bush. This page was last modified on 25 June 2017, at 17:49.